What do the words Upvaas Special Sizzler conjure up in your mind? Images of weird tasting food? Can’t blame you. It is an unusual concept, which warrants a certain amount of scepticism. But but but, the newest sizzler place in the city, Sizzle Desi, is here to correct your mental imagery. Let’s go chronologically though. 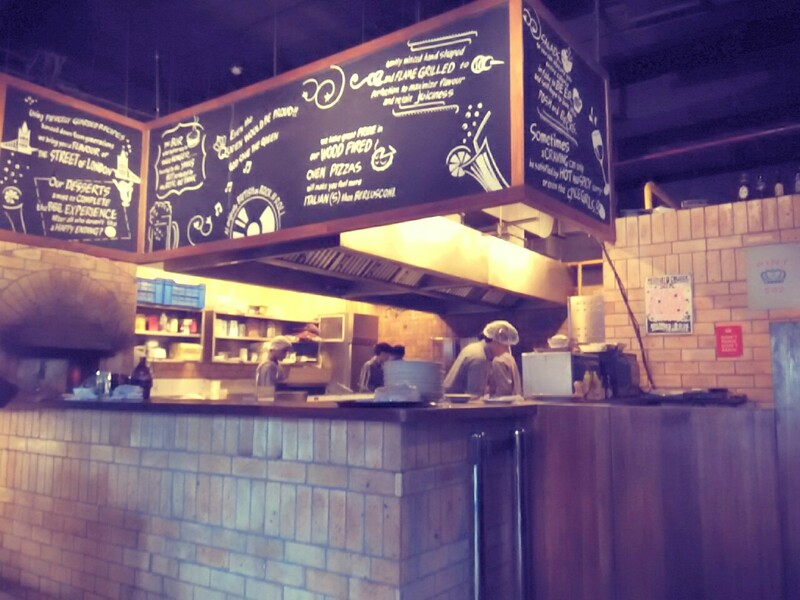 Recently, on Sankashti, we checked out Sizzle Desi, which offers soups, sandwiches, wraps and rolls, burgers and pasta, apart from continental and desi sizzlers, of course. We began our dinner with an appetizer – the Jalapeno & Corn Cheese Balls. It was the right mix of spice, crunch and delicious cheesiness. 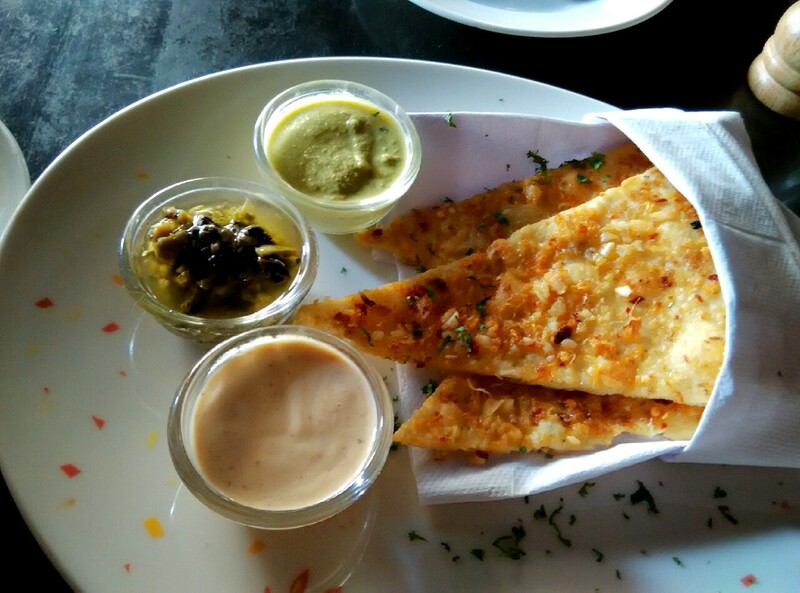 The mayo dip that came with it was heavenly – I had called for an extra dip to eat spoonfuls of just that. Since we were in the mood to experiment, we called for the Chimichuri Spiked Mushroom Wrap, having no idea what chimichuri is. Later, owner and Chef of the place, Mr Parag Joglekar explained that chimichuri is a green sauce, a mix of parsley, garlic, oregano and white vinegar, among others. Being a sucker for mushrooms, I loved the wrap. The green sauce tasted similar to pesto. It came with a side of wedges, which was coated with a bit of what I think was amchur powder, to give it a nice zing. The wrap is quite filling, BTW. There aren’t too many options for beverages, but the Watermelon Iced Tea was super amazing. Next up, we sampled the Upvaas Special Sizzler, which is an off-the-menu dish. 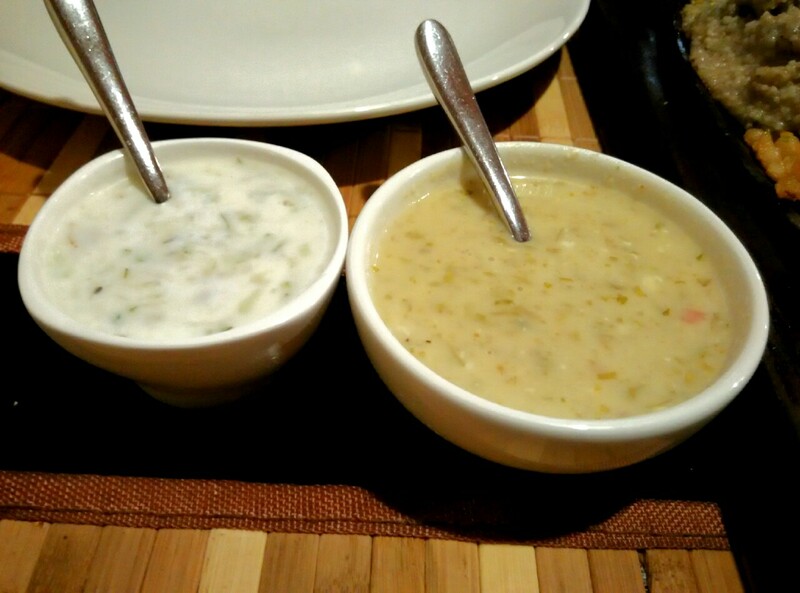 It was, however, tough to decide what to order because there is nothing regular about any dish at Sizzle Desi. We had to choose between Grilled Cottage Cheese in Harissa Sauce, Mushroom Manchurian, Corn & Cheese Pattie with Baked Beans and Sambal Glazed Cottage Cheese. Life can be tough. Now, I am not big on Maharashtrian cuisine. Varan-Bhaat, Zhunkha-Bhakhar and the like just don’t excite me. 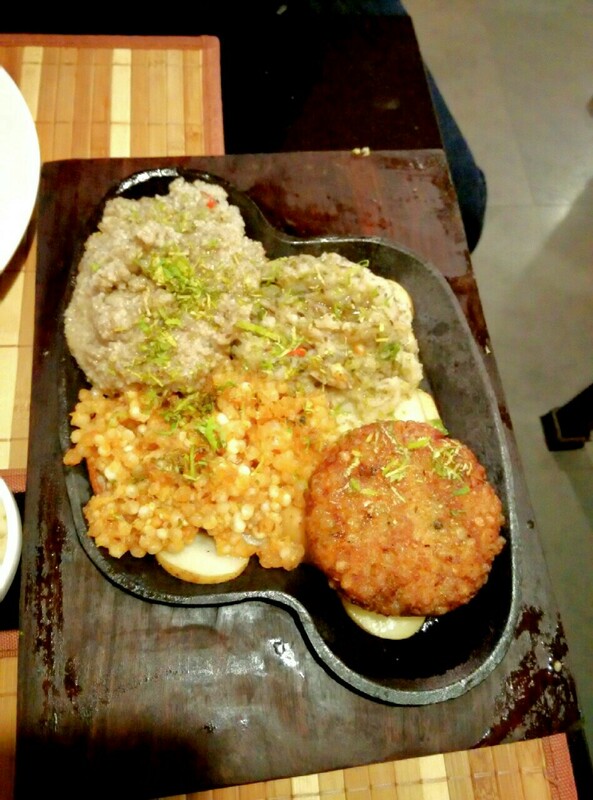 So I was taken aback by just how much I liked the Upvaas Special Sizzler — which was essentially Sabudana Vada, Sabudana Khichdi, Batatachi Bhaji, Varaicha Bhat, with a side of Kakdi Kachumber and Shengdanachi Aamti. If you’d offered me something called Shengdanachi Aamti in any other situation, I would have thanked you and then made an excuse to not have it. And boy, was it good! I’m the kind of fussy eater who wouldn’t ordinarily touch Sabudana Vada at home. If my mother had seen the way I devoured the dish, I suspect she would never have spoken to me again. But the sizzler was so darn good. My friend Devashish AKA Bombay Sufi (click here for his amazing Hindi poetry) also isn’t a fan of Maharashtrian food but he shared the same sentiments when it came to the Upvaas Special Sizzler. 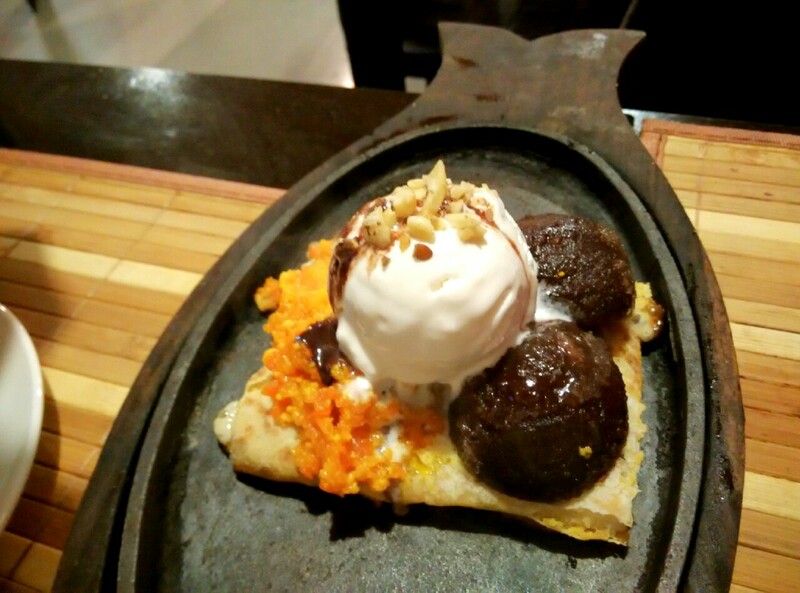 For dessert, we could have gone for the sizzling chocolate brownie, but hey, every other place serves that. We instead went for a supremely unique sizzler desert – a scoop on vanilla ice-cream, Gulab Jamun and Gajar ka Halwa on a bed of Puran Poli. Topped with chocolate sauce, of course. Once again, it sounds odd. But trust me, and trust Mr Joglekar’s culinary experience of 22 years, it was AWESOME. And I don’t even like Puran Poli. But somehow, the desert on the whole just worked for me. The Gulam Jamun was delicious, the Gajar Halwa didn’t look like it had a lot of food colouring. You have to try the combination to know what I’m raving about. We thought this was the end of our dinner but we were in for a pleasant surprise. 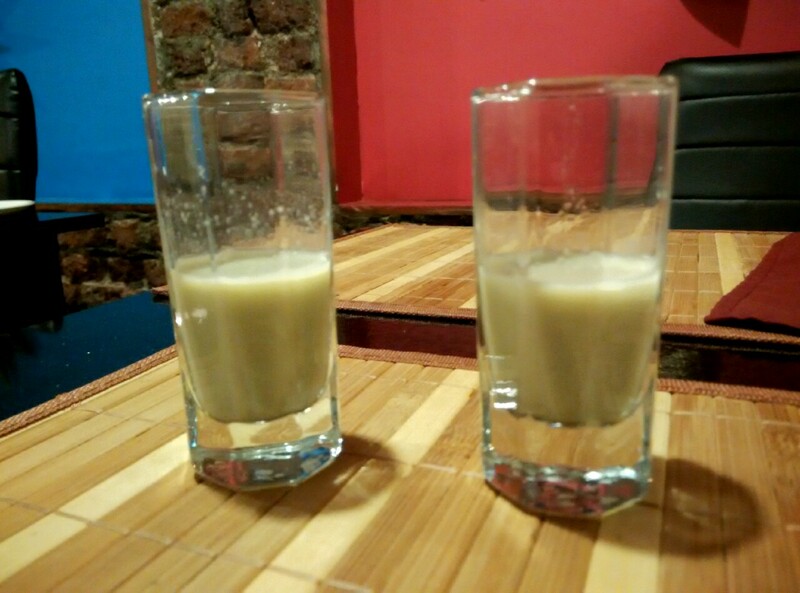 We were offered Paan-flavoured shots. Yes, Paan-flavoured shots. And they were brilliant. No mukhwaas or saunf can compare to ending a meal like this. The service was attentive and polite. The décor, admittedly, is nothing to write home about. It’s a rather simple affair. The efforts seem to have gone entirely into the food – so we aren’t complaining. While not an ideal date place, it’s definitely a good option for dinner with family or friends. Originally intended to be a purely sizzler and beer place, Mr Joglekar had to re-imagine the whole restaurant because residents in the area weren’t okay with having a restaurant serving liquor. Everybody loves a good sizzler. 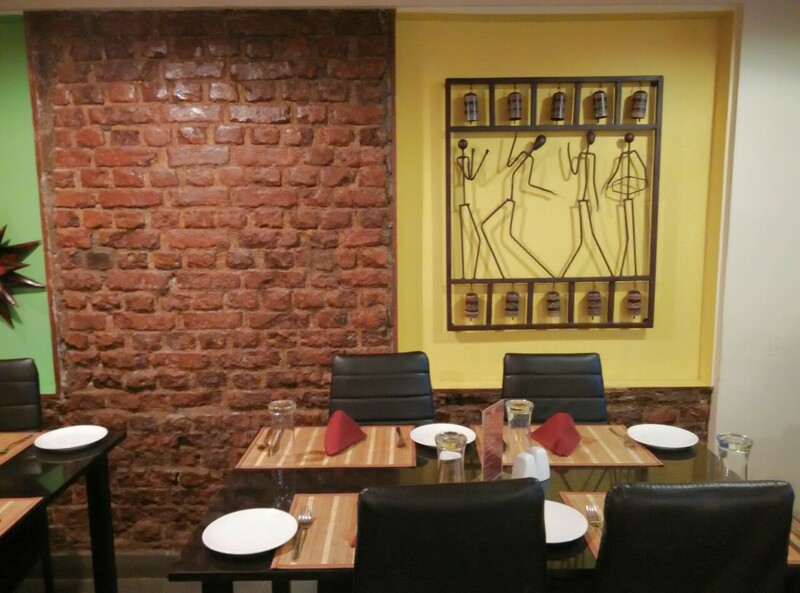 Head to Sizzle Desi for more than just that. Not-so-fine print: Big thanks to ‘Rotaractor forever’, Yashad Kirtane, for extending the review invitation to me. Which means yes, we were guests of the restaurant for this meal. BBC has a relaxed, causal vibe to it. We settled in and scanned the menu, which has been upgraded lately. 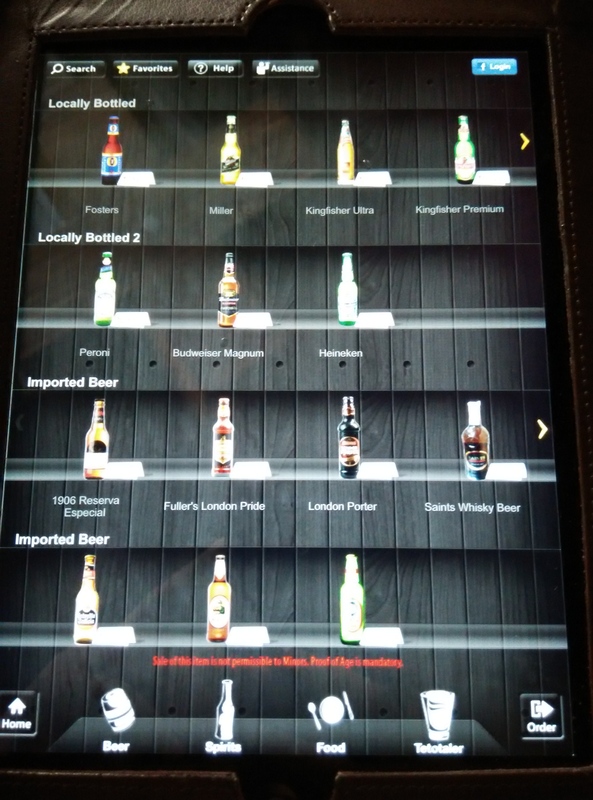 What stands out in their alcohol section are the freshly brewed beers. I tried the Doppelganger, which was pretty smooth, the SummerSault, which was full-bodied, and the White Zen, which was on the lighter side. A huge plus point is that they offer samplers of the beer if you ask for it. 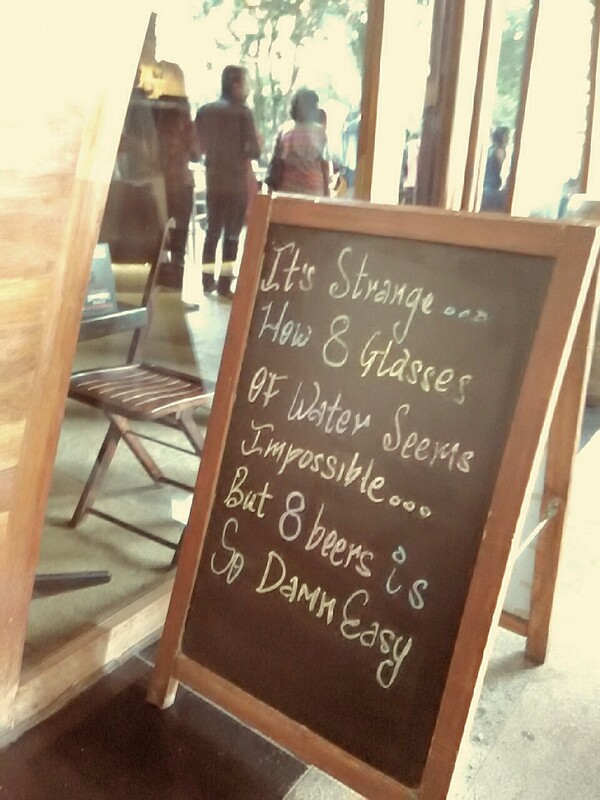 So do try the brews before calling for one. The next thing on the menu to catch my eye was the beer cocktails. 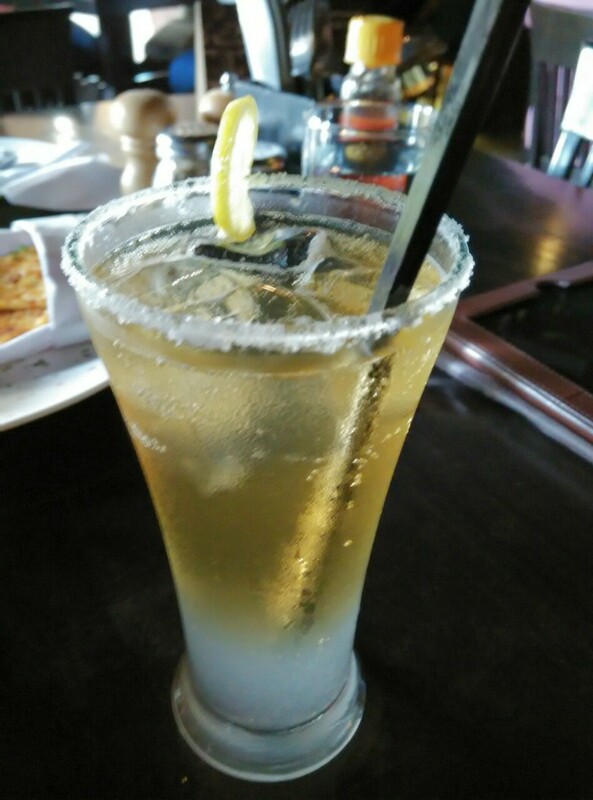 I went for the Lagerita (tequila, triple sec and KF draught), which was super light on the palate, and quite delicious. Sosha tried a Fire and Ice cocktail, which was pretty good. I also had a Sangria (white wine), which was perfect. Sosha had a Kokum Cooler cocktail (with vodka), which was unusual and refreshing. And then of course they had the usual Rum, Whiskey, Vodka, etc.. Won’t get into details there. Coming to the food, there’s plenty on offer. Soups, salads, starters, tandoors, skewers, wraps, burgers, pasta, noodles and finally, the wood oven pizzas, which is BBC’s strongest point. And justifiably so. 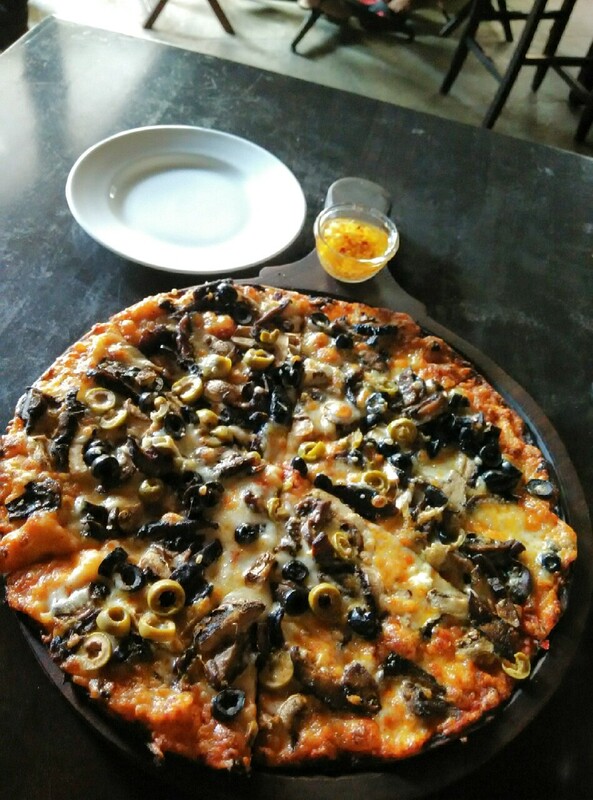 The Wild Mushroom Pizza (with added olive toppings) was heavenly. The base was super soft, the mushrooms succulent. The Garlic Bread here was pretty different – instead of soft bread, these were crisp triangle shaped slices. The garlic bread came with three dips – tahini (sort of bland), olives (green and black olives in olive oil; absolutely amazing) and jalapenos (super spicy), which made it all the more interesting. 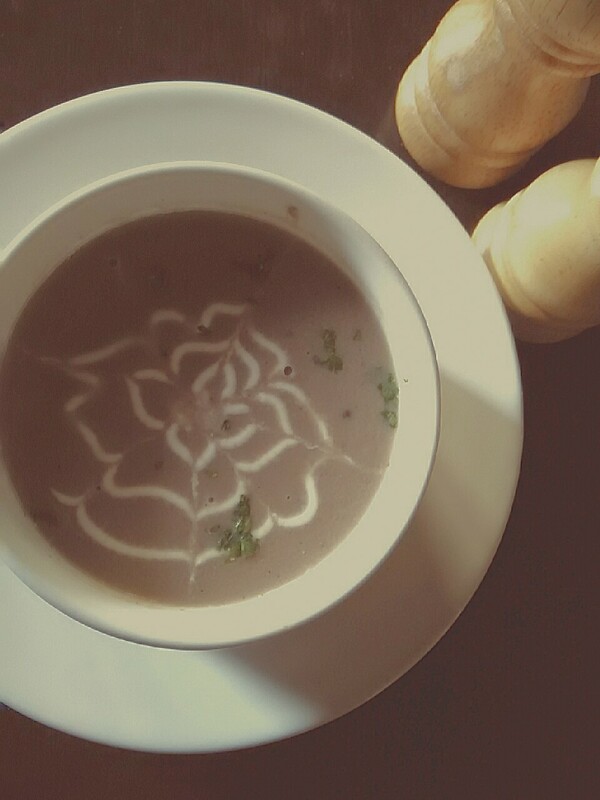 The Mushroom soup was a delight to the senses. You could smell mushrooms the minute the server got the bowl to the table. We also tried two salads. While the Greek Salad was definitely fresh, but could do well with a lot more feta cheese in it. 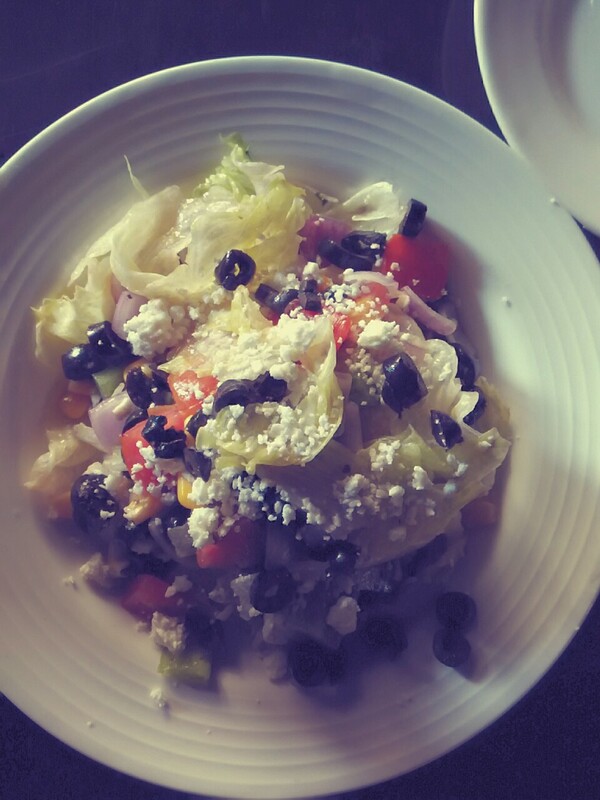 Next, the Summer Salad (exotic veggies in ranch dressing, Mexican style). 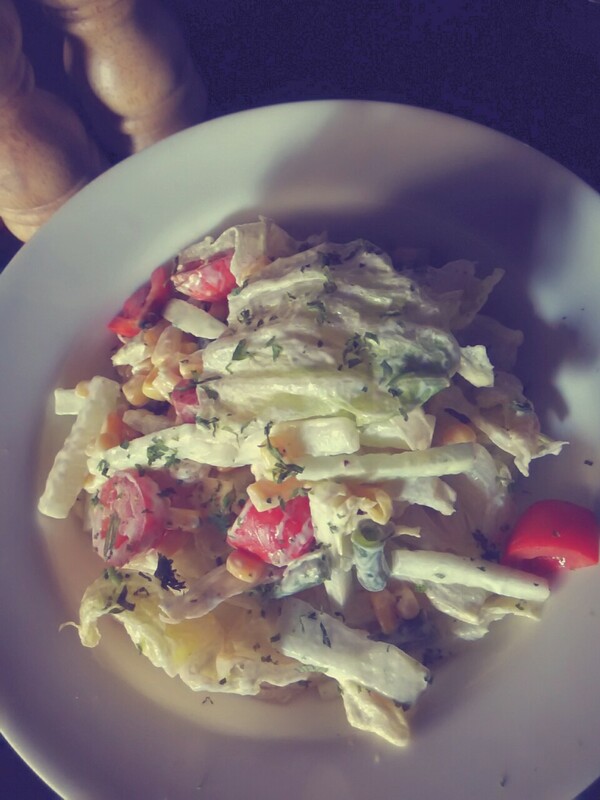 While there was nothing exotic about the veggies (lettuce, corn, cucumber, french beans, cherry tomatoes), it was rather delicious. Upon recommendation by the chef, we went for the Veg Lagasne, and we’re glad we did so. 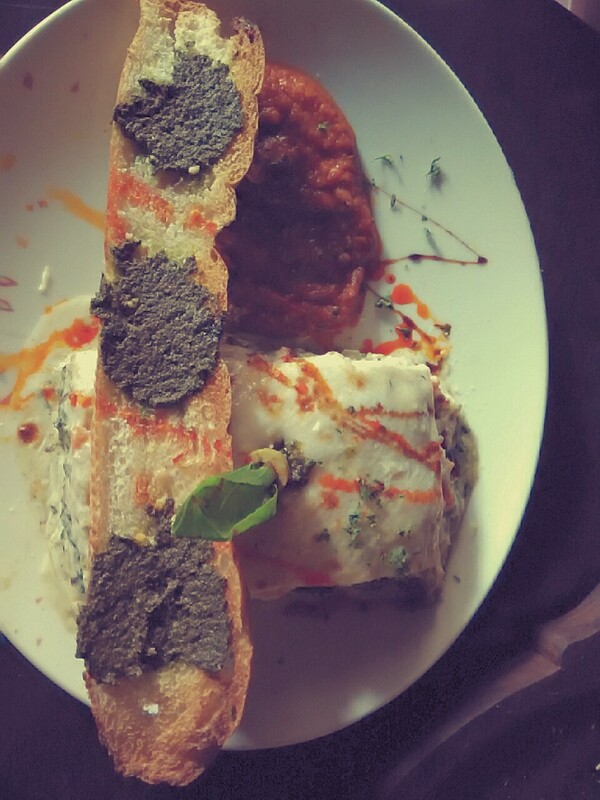 The dish was served with a godawesome tamarind sauce and bread with pesto on it. The tamarind totally made the minced vegetable between the pasta sheets taste drastically different and better. The plating made it a visual treat. A winner. And the pizza, of course, oh my goodness. Too amazing. 😀 They also have a section dedicated to all things British. Like Fish & Chips and Shepherd’s Pie. And though of course we were stuffed towards the end of the meal, we tried dessert too. 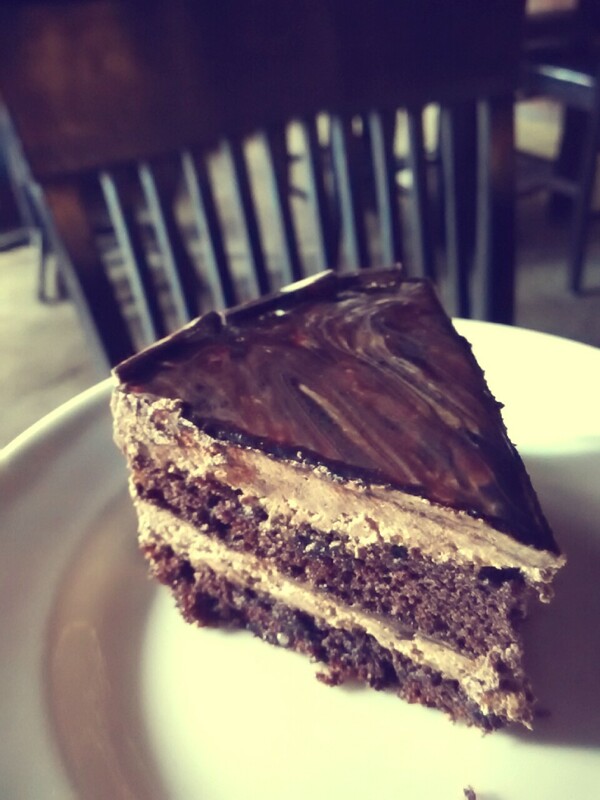 Sosha went crazy over the Chocolate Hazelnut Mocha cake and I, over the Caramel Custard. Deliciously soft and light, it melted in my mouth. Apart from all of this, they list the day’s specials on a blackboard menu hanging on the wall, which features items off the menu. Pretty cool, I say. The music at BBC of was a mix of genres. So there was Dido playing after Duran Duran! Thankfully, the audio levels are quite low, so you can actually have a conversation over your meal. The service staff is pretty polite and prompt. They have a bar counter, a seating pod in shape of a large wooden barrel, and regular seating. The crowd was decent – young professionals, families. Also, BBC has an open kitchen – which is rather comforting, because you hear all these horror stories about restaurant kitchen and you tend to wonder how hygienic they really are. In place of a traditional menu card, they have sleek tablets you can place orders from. Though many restaurants in the city (and country) have adopted technology in various forms, I believe few in the vicinity have tablet menus. So that’s a plus. All in all, the British Brewing Company gets a double thumbs up from me. Fine print: We were guests of the restaurant for this meal. 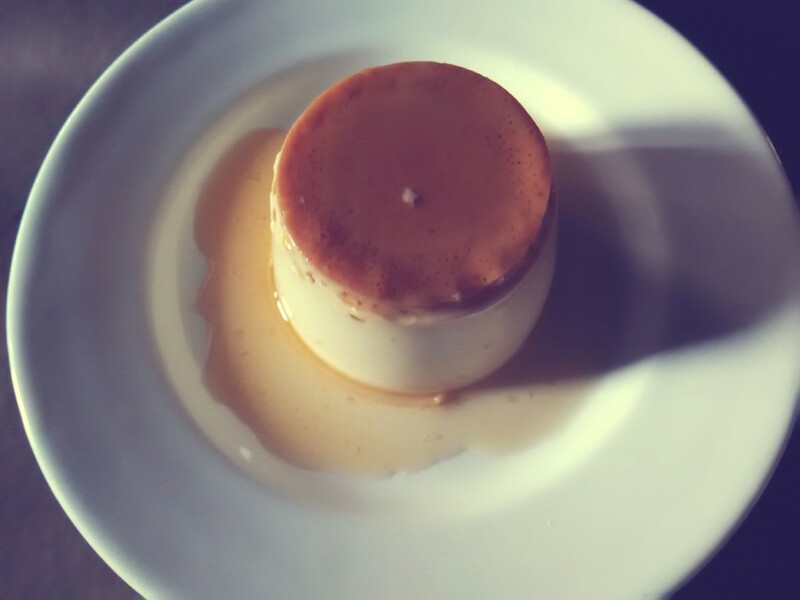 I’d been hearing about the food scene in New Bombay for quite some time and so when Navi Mumbai Foodies invited me to review Coral Lounge in Vashi, I jumped at the chance. And I’m glad I did because Coral Lounge was funnn. The place is classy and the music loud, as expected. Wednesdays are Bollywood nights and so we heard everything remixes of everything, from the latest Yo Yo Honey Singh to Chittiyan Kalaiyan. Fun thing is, they have karaoke as well. The place was pretty lively in the middle of the week. There were groups of college kids and young professionals, probably chilling after a long day at work. The seating was comfortable and the decor, minimalistic. I went with my foodie friend from school, Shiva, whose opinion on the non-vegetarian food I’ve reproduced here, since I’m shuddh shakahari. He had a Budweiser, while I, being the sophisticated lady that I am (! ), had a peach flavoured margarita. The menu has a wide range of drinks. So from champagne to a Glenfiddich to a Grey Goose to a Carlsberg, they have it all. 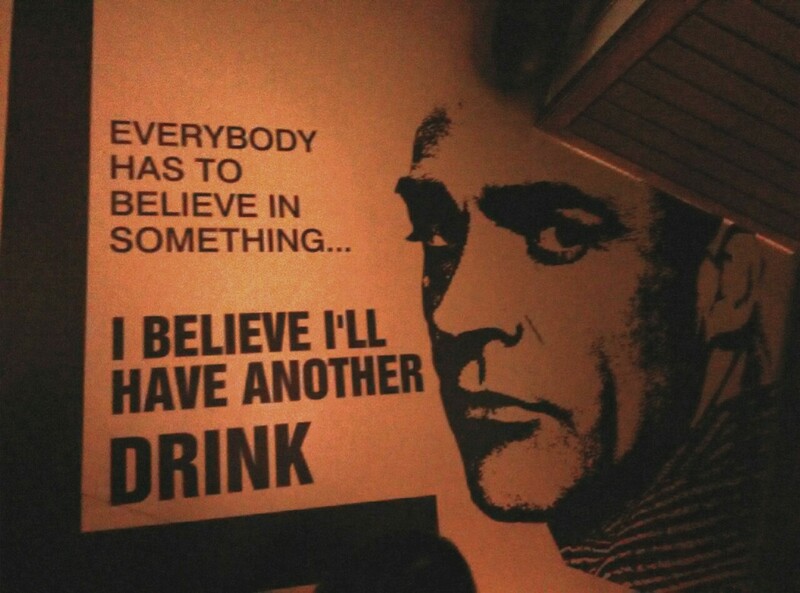 They also have sme in-house cocktails apart from the usual suspects. And of course, as any lounge worth it’s salt would, they have shots as well! The non-vegetarian starters arrived first and Shiva felt the Squid Calamari was a winner with the beer. 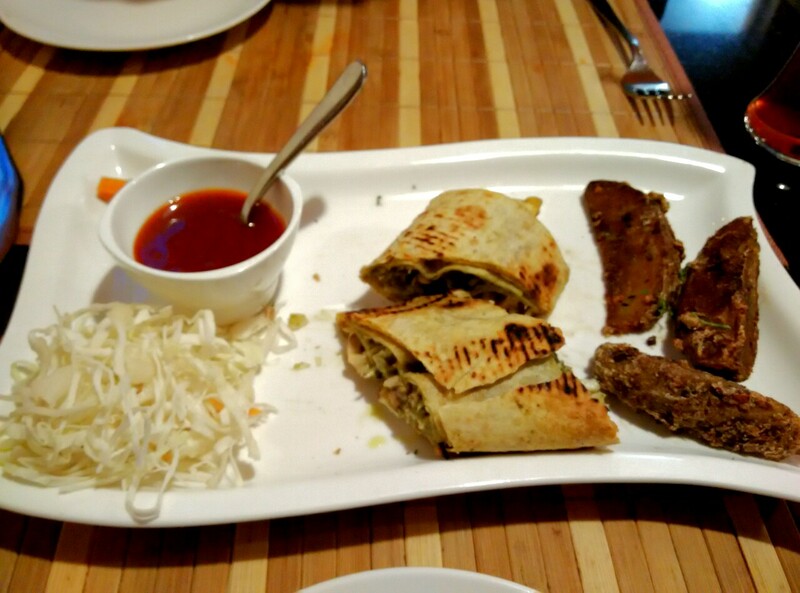 The Awadhi Seekh Kebab was cooked well and went well with the drinks too as it was spicy. The vegetarian nibbles were delicious. 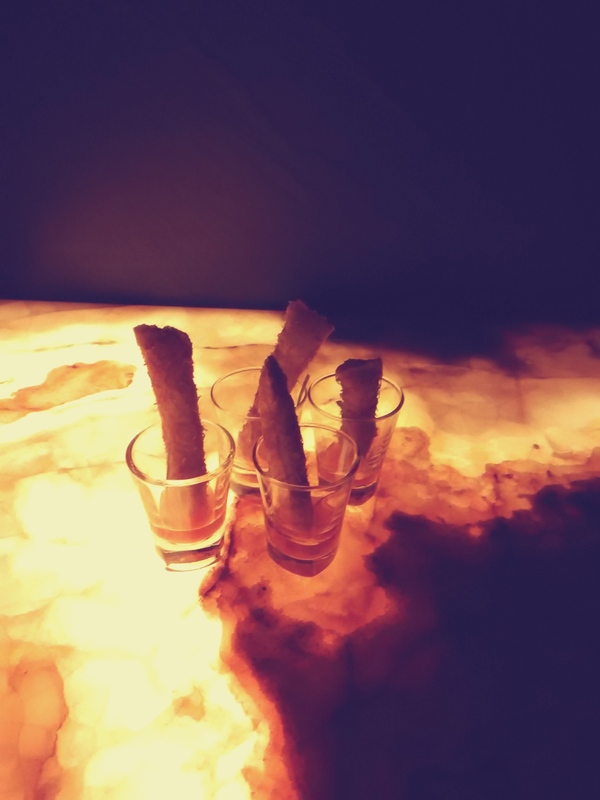 I especially loved the concept of Veg Kurkuri — pastry cigars stuffed with exotic vegetables and cheese, served in a shot glass containing sweet and sour sauce. Full points for innovation and flavour. 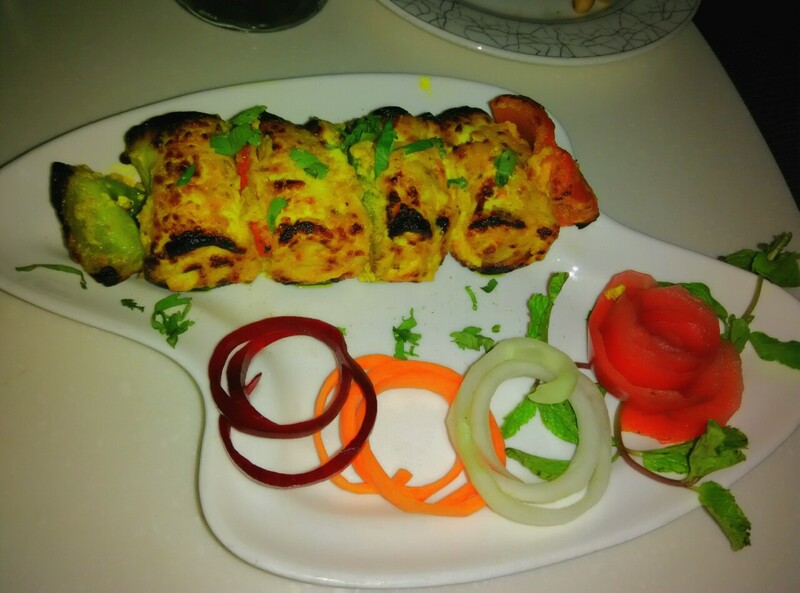 Next came the Paneer Makhmali Bharwaan Roll. Soft and succulent, a total delight for paneer fans such as yours truly. 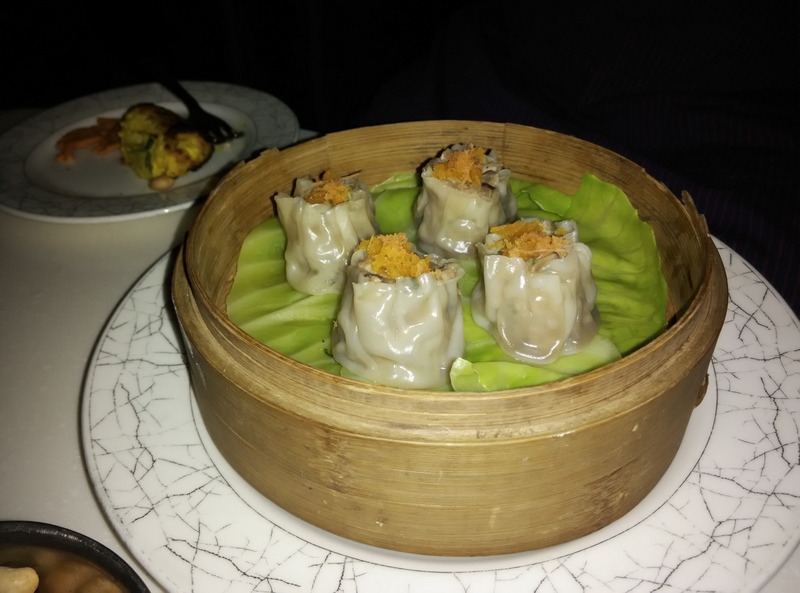 Then arrived the Chicken Siu Mai, dumplings served in a cute traditional dim dum steamer basket. Shiva approved of the taste of this dish too. The Rock Corn Tempura (veg) came next. Shiva found it rather bland but I felt it was decent. Not great but not bad either. We stuck to appetizers and drinks because, really, who has a main course at a lounge. But should you want to call for some (not judging you), there’s plenty to choose from the usual Indian and Chinese fare on offer. The service was polite and prompt. 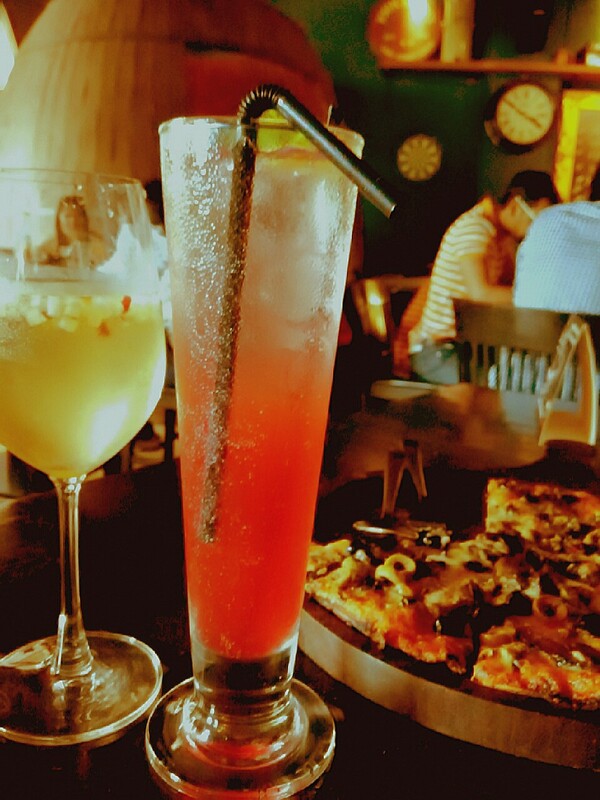 All in all, I’d say Coral Lounge would be an ideal place to visit if your idea of a fun evening was great drinks, loud music which renders conversation difficult, and yummy finger food. I’m impressed by Vashi though. Navi Mumbai Foodies, led by Pooja Trehan Dhamecha, often does food trails in the twin city and I hope to join them the next time around too! And now, here’s a 15% discount code for Coral Lounge for all you lovely readers. Because I love you and I’m awesome like that. CODE: MSX15. 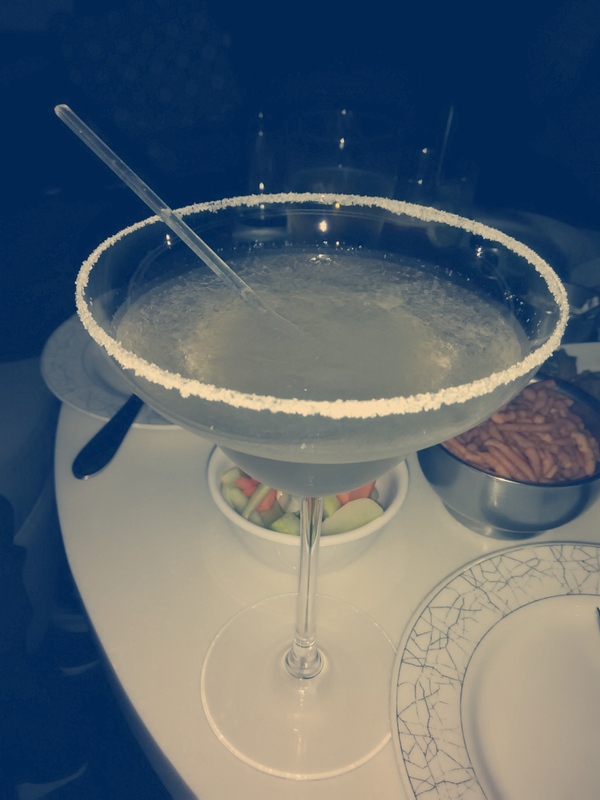 Fine print: We were hosted by Coral Lounge on behalf of #NaviMumbaiFoodies. Grown out of Holi? Or just become environmentally conscious? This Holi, I found a way you can be like a kid and have responsible fun at the same time. In my opinion, relishing Häagen-Dazs’ Holi special collection comes close to that. Growing up in Mumbai, there is no escaping the ingenious Falooda. For the most part though, I managed to keep away from the slimy looking drink/dessert. But, the Holi special HD falooda was something else altogether- super refreshing and not icky at all. I was part of the preview at the Bandra outlet of HD and the deft chef, Anthony, demonstrated how they make it. 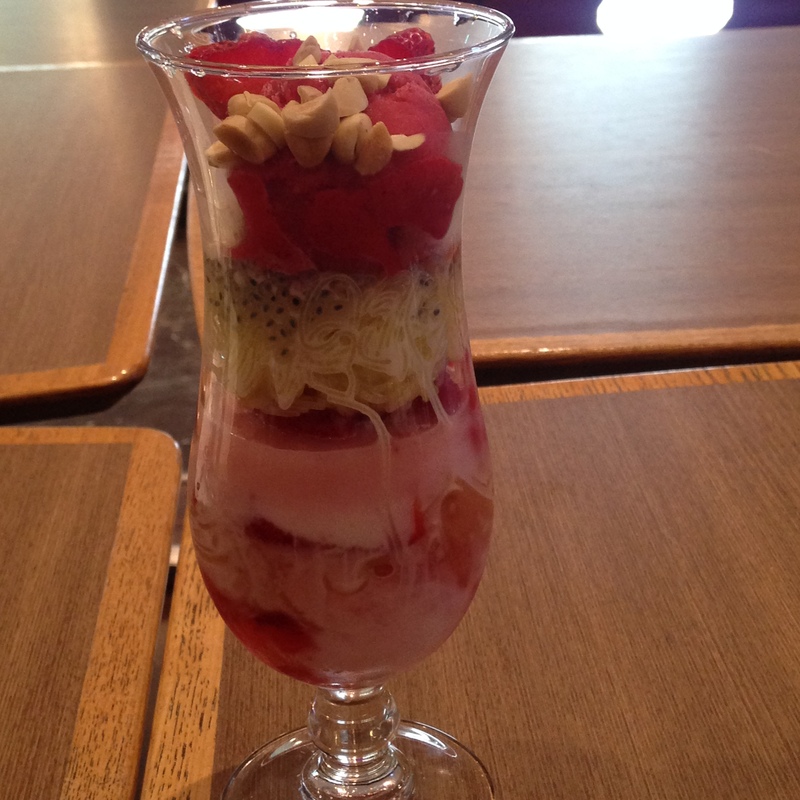 Beginning with crushed ice, moving on to the flavoured vermicelli, coulis, sweet basil seeds, topping if off with HD ice cream, some chopped fresh fruit, more vermicelli and basil seeds, and adding another scoop of ice cream, the process was complete with some dried nuts as garnish. The strawberry falooda had milkmaid in it and personally, I found the milky flavour was great. 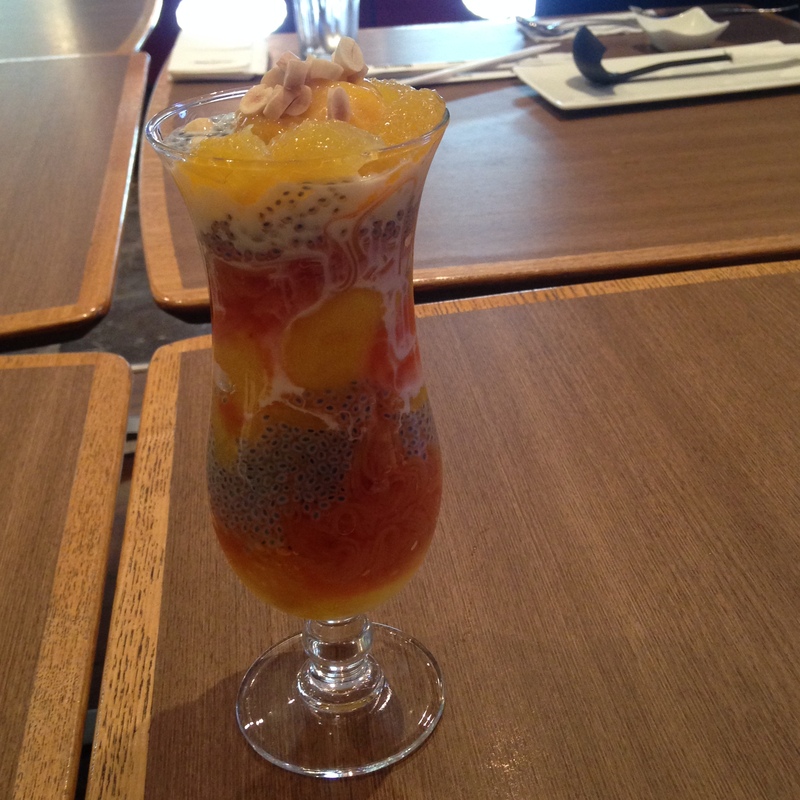 The mango falooda was made with a vegetarian sorbet, and was a mélange of colours. 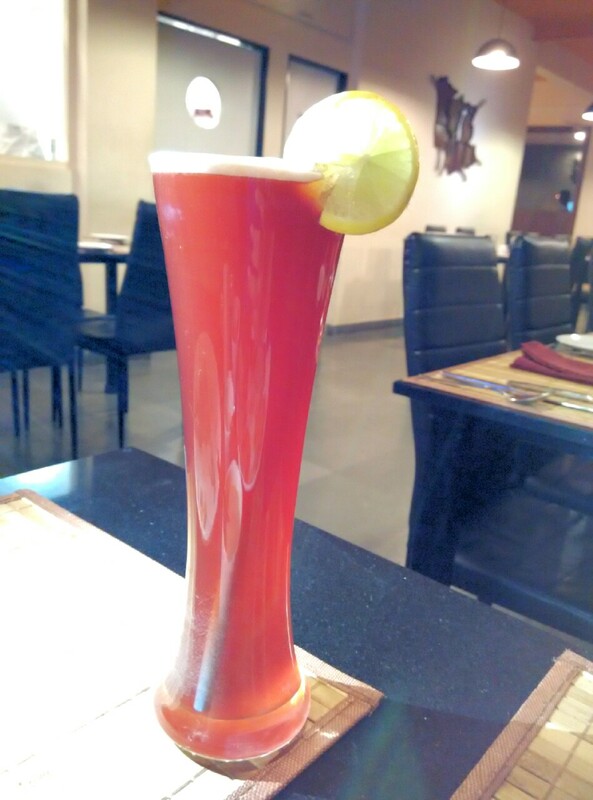 A fellow blogger aptly likened it to a sunset. 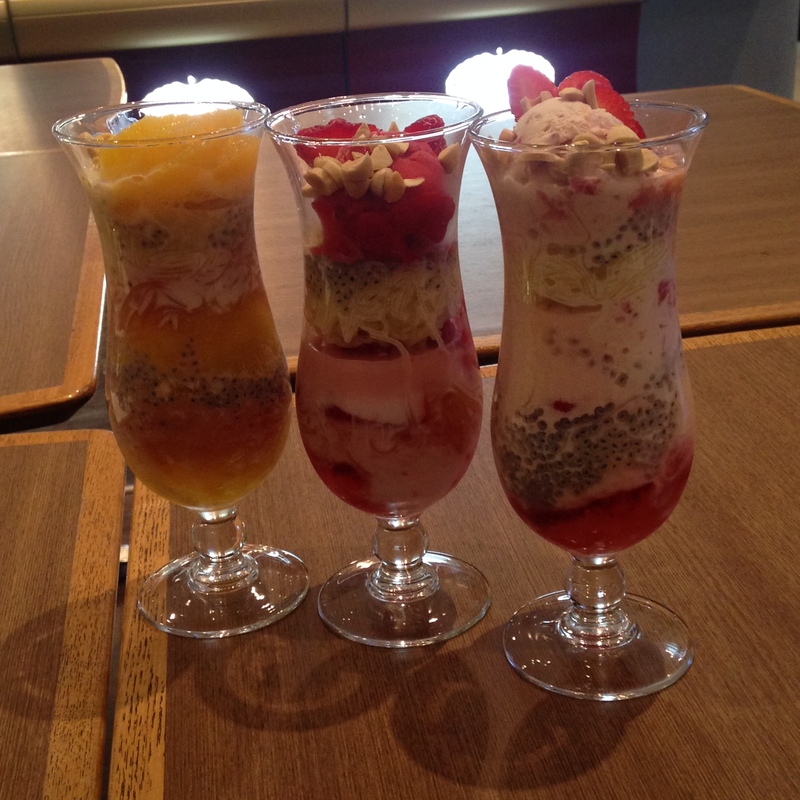 The best part is that you can customise your HD falooda with any flavour you like. Kruti, the PR executive who was with us, called for a raspberry falooda and was beyond herself with delight, what with raspberry being her favourite flavour at HD. I always love it when foreign chains try and localise their products. Some score, some miss. But HD definitely hits a goal with their Holi falooda. Available at Häagen-Dazs outlets at Bandra, Powai and Lower Parel from 1st to 8th March, 2015. Priced at Rs 395 plus taxes.